According to the International Association of Firefighters, cancer is the leading cause of death of firemen. This makes sense because they are exposed to countless carcinogenic chemicals on a regular basis, including asbestos. Asbestos is a problem because it is present in older homes, and when these homes catch on fire, firefighters expose themselves to it when putting out the fire. This can happen in a few ways, one being non-friable asbestos, which is asbestos that is not flaking or damaged, becomes friable and damaged due to the fire. The asbestos is then in a state where disturbing it can release the toxic fibers into the air. Firefighters can also be exposed while extinguishing a fire when cold water is sprayed onto hot asbestos, further releasing the damaged fibers into the air. Another problem is that ceilings and walls can collapse or be pulled down, and in the process asbestos in certain materials can be released into the air. Asbestos can then get on clothing, contaminating it. When this clothing is not handled properly, it can hurt anyone who comes in contact with it. After putting out a fire, any clothing that may be contaminated needs to be removed from service and placed in a plastic bag to ensure others will not be at risk for asbestos exposure. The response site also needs to be tested to make sure any contamination is not a danger to anyone who responded to the fire. One of the most infamous examples of firefighters being exposed to asbestos is the September 11, 2001 attack on the World Trade Center in New York City. Between 300 and 400 tons of asbestos fibers were used in the World Trade Center, which were then released into the environment after the attack. First responders waded through the wreckage exposing themselves to asbestos and countless other carcinogens while trying to help the victims. Due to the long latency period between initial asbestos exposure and the time of diagnosis of asbestos related cancers, first responders who served during the attack are only now just learning they have mesothelioma, asbestosis, and lung cancer. With the amount of chemicals that firefighters are exposed to, it is clear why so many are diagnosed with cancer. It is important to give firefighters the tools and gear necessary to stay safe while doing their job. 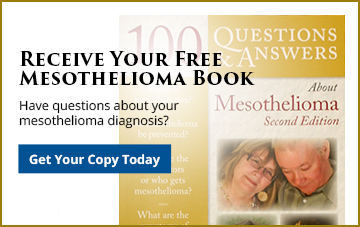 Were you or a loved one exposed to asbestos and diagnosed with mesothelioma, lung cancer, or asbestosis? At Goldberg, Persky & White, P.C. we know it can be difficult to be diagnosed with an asbestos related cancer. We want to make it easy to contact us so please use our contact form or call 412-471-3980 to speak to one of our attorneys.